It’s truly inspiring to see someone achieve so much with so little effort. Also in implant dentistry: to reduce the data to insert and to develop an intelligent system is not idealism but progress. Rigorous and refined: the system Implart-Winmed-Galileo II perfectly conjugates precision and simplicity. The transmission of the data from the clinician to the technician, through a simple transparency film, is very user friendly and error-proof. Its compatibility with all brand implants allows to be used by all the clinicians. Winmed software grants the clinician to determine the perfect position of all implants to be inserted. The use of plates with radiopaques references allows the software to annul all errors produced by the positioning of the patient during the computed tomography (CT or CAT scan) and therefore it allows a sure pre-surgical planning. The system do not need any data adjustment so Winmed-Galileo II system is about 10 times faster and safer than comparable systems. 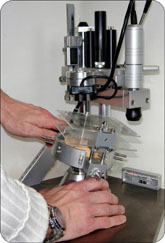 The right position of the implant is given by two printed films properly applied to Galileo II so the technicians easily find the implant positioning in the model with any possibility to make a mistake. A webcam shows on the PC video virtual sight and the operator must sights the position of the implants, by tilting Galileo II. A clever system allows the sleeve positioning exactly in the position found by the webcam. 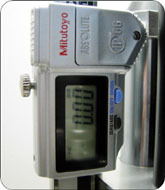 The centesimal control of the vertical height guarantees the precise procedure of the immediate load. Once completed the surgical planning it is possible to archive the printed film as a proof of the right planning. In addition to digital back-up of the work images, it is possible to make videos of all steps to validate the operating procedure adopted.